I have dreamed of working in an African orphanage project ever since I watched Comic Relief as a child; but given that I had my first child before I finished university-I was unable to do the gap year travel thing when my peers did. It will be some years before my children are old enough for me to consider doing a long-standing work placement, but I have been very keen on the idea of doing some kind of family volunteer holiday with them at some point… Perhaps say one Christmas when my daughter is old enough. For now, at 6 years old; she is still too young for this in my opinion. As a pilot, my partner gets many opportunities to travel, and we are sometimes lucky enough to be able to travel with him. My sons were on school ski trips at the time this trip popped onto his roster; but I wasn’t about to pass up on this opportunity to go to Kenya, Africa, with our daughter and to grasp the chance to visit an orphanage local to Mombassa where we’d stay in the crew hotel. I had heard that some orphanages get a lot of tourist support and visitors and that the children in some of those homes are actually more privileged than children in villages with their parents! I was keen to ensure that any support we gave would make a difference to underprivileged children, rather than topping up the coffers for already well-funded projects; so I emailed and called the hotel we were due to stay at to ask for advice on which orphanage projects near to them most NEEDED the help. Unfortunately, despite promises to get back to me-they never did. Just a week or so before we left, I posted an appeal to parents at my children’s school for any donations of clothing, shoes, toys, educational supplies, etc that people might give me to take with a brief explanation of why I was going… I was so overwhelmed by the response!I was given a huge amount of wonderful goodies to take to the children. One parent who owned a pharmacy provided me with a multi-pack box of children’s paracetamol and ibuprofen solution, boxes of toothbrushes, toothpastes, etc… Another parent I had never met previously even gave me a large lump sum of money (something I hadn’t even asked parents to donate) to buy things in Africa for the orphanage, as I had mentioned that I would be buying some items out in Africa. Several others went shopping for stationary, learning aids, socks, and much more besides! I was also given football tops by one Mummy who had visited an African orphanage before and said the children go mad for these things… Quite honestly I found the huge response I received, at such short notice, quite emotionally overwhelming-I did shed a few tears of pleasant surprise at people’s heartwarming generosity! We talked to our daughter about how the children’s lives differed from her own, and explained that these children had no Mummy and Daddy so that she would begin to understand how privileged and lucky she is by comparison. Since we wanted her to feel personally connected to the reasons for the visit-we encouraged her to put together a collection of her own possessions to donate… It was really touching to see that she was willing to part with items such as pretty clothes, toys, etc. I decided in the end to carry the bare minimum of luggage, and to re-wear as many clothes, and sacrifice as many shoes etc for the trip-so that I could carry all of the donations instead. I managed to carry over 32kgs of donated goodies using mine and my daughter’s ataking the usual travel wardrobe so that we could make room for everything… We ended up using almost 40kgs of our 60kg baggage allowance on the goodies we took! I wrapped the medication bottles in a carrier bag, and then in clothing to prevent breakages. It had to go in the hold luggage due to the carry-on liquid regulations. 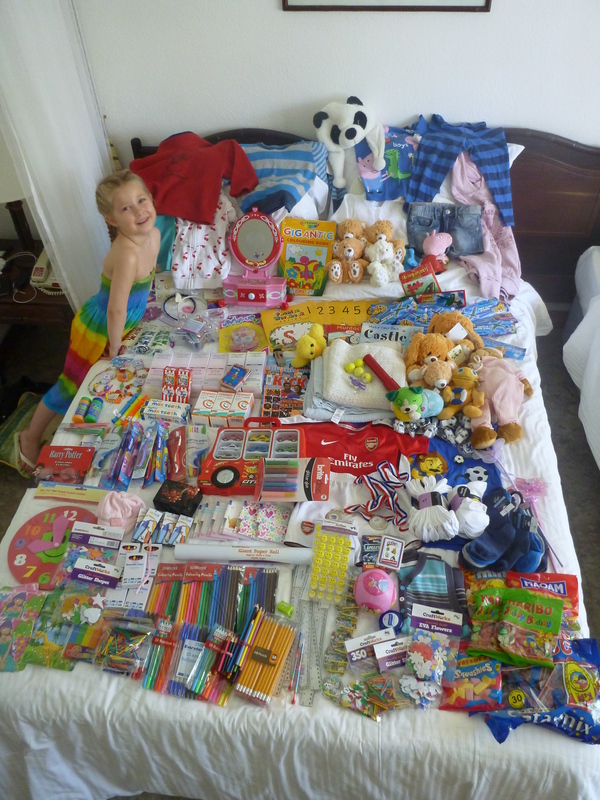 This is a picture of many of the items we took laid out on the hotel bed before we left for the orphanage. On arrival, I spoke to a lady at guest services in our hotel and she recommended the New Hope Project Orphanage. She told me that she had been to visit herself, and explained that the children all shared one toilet, and received almost no support, except from the kindness of local people. Japheth Eyama, the project’s founder came to collect us from our hotel in a beaten up old car with it’s upside-down-steering wheel, a juddery engine and no wing-mirrors… He was very keen to know how we had heard about them-since they don’t get many visitors, and as he drove us away, he spoke to us about the project. My pre-set concerns about corruption and not wanting to hand him any funds slowly melted away… Not only was he happy to take us shopping first, but he clearly seemed very passionate and invested in the success of the project. He was clearly completely personally immersed in the project life and success. He explained that the project started out of necessity. Too many orphans who needed help. Initially, it was simply an orphanage, but in Kenya, children need to learn to speak a good standard of English to guarantee a successful future. Schooling places need to be paid for, and the school places they were able to afford were not delivering good enough results to ensure a bright enough future for the orphans, so Japheth additionally set up a nursery school for the younger children and a boarding school for the older children too… The school had become so successful that they ranked just one place below a very expensive (even by British standards-at over £1000 sterling per term) private school, and were able to secure a few non-orphan children to help fund the ‘bursaries’ for the schooling fees of the orphaned children! They had wired electricity into the New Hope Project for the orphanage and school (I think this mainly just meant a light bulb in the main rooms, rather than plug sockets). I saw no obvious evidence of any plug sockets whilst there at least. Japheth also explained that the success of the school, and the availability of electricity had drawn local people into the site and led to a village and community developing around the project. Japheth took us to a non-tourist area with a supermarket (that wouldn’t rip us off with tourist prices) so that we could spend the money we had for them. We were quickly surrounded by beggars and street children. It had been explained to me before, that many of the street children are HIV+ orphans who cannot get into mainstream orphanages as a result. Japeth told me that you could tell the street children over the normal children who were simply begging because they look dirty and their clothing is more ragged. I gave some of them a few spare items that I had on my person, but was soon inundated with beggars. On entry to the supermarket, we were scanned with a hand held metal detector-this is standard to ensure shoppers aren’t carrying knives etc. I told Japheth to select the items he needed to the value of our budget. He purchased food, cooking oil, individual toiletries (the children had been sharing which caused a lot of cross-infection), razors (for the older boys), paper, card, exercise books (the children had been sharing these as they didn’t have enough for them to have one each), toilet rolls, Detergent, Soap, and Vaseline (for each child-which they use as a barrier for their skin). We took almost £500 in total, plus all the bits I had purchased in advance, and this paid for enough of these items to carry them through for a couple of months… I felt pretty guilty that I didn’t have more to give . I feel bad saying ‘I can’t afford’ more, when I know that we live such a privileged life, and they need so little to get by on! On the day we visited (Easter Sunday), the younger children (about 30-40 of them) were being moved from a pretty squalid block to a lovely new home building that had been built with the help of foreign project workers and local people. There were 2 Norwegian volunteer workers on gap year placements. As such-it was a hive of activity, with beds and mattresses being carried between the two sites by the older boarding school children and the workers. We sat down with the children and handed out the contents of the suit cases to them. It was fantastic to watch our daughter open up like a little flower bud to the sunshine as she forged friendships with the New Hope Project children. She pulled out her little rucksack of her personally donated gifts and handed them out one by one to the grateful children. I expected a bit of a scrum, but the children were exceptionally polite and happily received whatever she gave them with curious and well-mannered gratitude. I was really won over by their genuine pleasure at receiving the items, ones that may not have been considered age-appropriate gifts here in the UK were still smile inducing and pleasing to the recipients. Some items we gave to Jepheth to store for communal use and adult supervision (eg medication, toothbrushes, toothpaste, stationary, and curriculum books, etc). We then gave our daughter the rest of the items to gift to the children… Plush toys, clothing, reading books, magazines, playing cards, whistles, modelling clay, sweets/candy for them all, beaded jewellery, hair grips, bottles of bubbles, jigsaw puzzles, model aeroplanes, toy cars, hats, balls, balloons, stickers, socks, etc. The children didn’t push or shove one another, they were simply happy to receive whatever they were gifted. One little boy was so thrilled to receive a fleecy panda hat that he didn’t take it off during the rest of our time there-it must have been 40°C and I couldn’t help thinking he must be boiling in it! It was really sweet to watch. I also took some novelty balloons that squeal and loop as they release their air when you let them go after inflating them. This caused a stir of giggles and mischievous fun as the children rushed around to recapture the balloons for more fun. Then we all played catch together. The children all played together so well. After we played with the children, Japheth offered us a tour of the rest of the project. We were shown the old accommodation. Quite honestly-it was shocking to see how the children had been living. The windows are all just holes with bars in the windows with a chicken wire mesh… There is Malaria in this part of Africa, and clearly these children are vulnerable as there are no mosquito nets up that I noticed, though with the move in progress-it’s feasible that these were simply in transit with the mattresses. …The flooring in the old block was dirty, and messy. Some of the dorms still had beds in them-and the children were clearly all stacked up together in high numbers. Their shared toilet was a latrine/hole in the ground just outside their bedroom (remember no-glass in the windows, so the smell hung thick in the air). The Children’s Time table – very humbling! Next we walked to the Boarding School… This was easily the most impressive site in the village, with a gated cluster of buildings. It also housed the project’s only tap which is where all of the project’s water is collected from daily, since running water is not available in most buildings. It is usually the job of women in Kenya to collect the water in containers. Chickens and goats that provide eggs, milk and meat are also grazed on the school grounds to prevent them from being stolen by people. Many of the desks and equipment had been donated by former volunteers and their families. The thing that most struck me was the children’s school time table… Their day looks gruelling by Western standards-I felt incredibly humbled when I read it! Just take a look for yourself at the hard hours they work from such a young age! I had expected to find the visit very saddening; but honestly, what struck me about the orphanage, was that despite the obvious poverty and lack of regular/guaranteed funding and facilities; the children at New Hope Project couldn’t have been happier… In fact, I would go as far as to say that the environment was so positive, happy, friendly and inspiring that it made the majority of British children look pretty miserable and ungrateful by comparison. There was no sense that these children felt in any way deprived or held back-quite the opposite in fact. They were absolutely thrilled to see us, and they wholely believe their mottos of ‘striving for excellence’ and ‘knowledge is power’. I was so impressed with how well-educated, well-mannered and articulate the children are, and how positive their thoughts and self-belief clearly are. One little boy, Kevin, aged 12 took my partner’s email address. He explained that one day, after he finishes university, he intends to become an engineer. He also confidently explained that he would one day like to marry our daughter! This last part made me smile. What really impressed me about Kevin and his peers though, is that they aren’t ‘victims’, indeed they are more than just ‘survivors’. They are champions for self-belief and education. They are going to proove that children can do or be anything if they believe they can. This cause really is proving itself baby-step by baby-step! Both my partner and I felt that in some way-this experience really made us question whether we ‘first worlders’ really do have it right. I know parents who have literally spoiled their offspring with iPads, iPhones, flat-screen plasma TVs in their bedrooms, expensive toys, gadgets and bikes… Yet their children seem insatiable… The moment that their peer has the next generation of gadget-they may no longer happy. Consumption and satisfaction are clearly not connected… Yet these children who had so little in the way of personal possessions have so much happiness and gratidute for the simple things like the opportunity to play, smile, eat, and be educated… They really do smile so much! I fully intend to stay in touch with the school and to send them money at some point. Unfortunately, due to massively wide-spread corruption in Kenya-the goodwill donation parcels that people mail them-more often than not never make it to them. Most parcels and packages to the project simply ‘go missing’. Having met with Japheth, I don’t feel he is corrupt-quite the opposite-he is absolutely committed to the continuing growth and success of the project. If anyone would like to contact them or offer support. or contact me in the comments below. Any donation-no matter how seemingly small would be very gratefully received. My lasting emotional reaction when people tell me what a lovely ‘selfless’ thing I did is to feel a bit fraudulent to accept such massive praise. I chose to do this not entirely for selfless reasons. I wanted my daughter to be humbled a little by connecting to the reality that the world doesn’t owe her anything. I also truly believe that we were more nourished by this experience than any of the children or staff at The New Hope Project ever will be… We may have put a smile on their faces, and contributed in the short-term to the education and feeding of the children; but the gift they have given us will last a life time. Such a wonderful and inspiring story. What a lovely lesson for your daughter. Thanks Annette. Yes, she will definitely hold onto this for a long time-hopefully always. You rad that quickly-it was a pretty epic post! This is incredible. I did something similar in Bolivia, and the kids were just so amazing. They were so thankful for little things like a plastic comb! Thanks for adding the contact info. I am headed to Kenya mid next year, and perhaps I can convince my friends that we can do something for them! How can I buy some tires for that girls bike? That was heartbreaking! Love the kid that told you he would marry your daughter! Hahaha. I hope you do get to visit… You’ll love it-and so would the kids. I’m not sure how you could get tyres without knowing the wheel sizes-but don’t worry-she was very happy with the bike-and the mud seemed to have formed a cushion in the wheel bed. She loves it just as well as it is. Hi Emma, I loved reading your article https://emmasbucketlist.com/2012/12/29/indoor-sky-diving-with-my-family/ on your blog at http://emmasbucketlist.com. I’m about to publish a new magazine called “ Bucket List Living” exclusively on the Apple Newsstand and I think the readers of the magazine would love to read the article too. I was wondering if I could reprint that article in the magazine. If you would like me to promote something for you, maybe a book or a specific web page you want me to point people to I would be more than happy to do it. Because it is an interactive magazine, once people have read the article they can be directed straight to a web page of your choice. Keep living your bucket list. Love your blog, you inspire me to create one very soon! Do it today Samgj3! Today is the day!! Hi Emma, I came across this article whilst researching somewhere to take my 5 year old Ophelia. It all started with is talking about children not having lots of toys/clothes/food like we do and appreciating it and long story short she spent the weekend bagging up toys, clothes and books for “children who have nothing mummy” everyday she asks when we can take them to these children as she wants to meet the children and give them the toys herself so she knows they got them…clever girl! This sounds like the perfect place and I know her school would get involved raising funds and toys etc. I’m just concerned about malaria and right now Ebola. Do you have any thoughts? How would I feel if she got malaria?? I’ve just read your article and I’m looking for a way to post band new boxes of loom bands for the young girls at the secondary high school in Kenya. Also, a couple of brand knew blankets for the children. Are you able to assist me as I would like to be 100 percent sure that my box goes to the children and not go missing. Also, great work you have done when you visited Kenya and an experience that your little girl will never forget. I dont have an address for a particular home. The box I have are for all the children or a school but have no idea how to go about it. Do you have a contact phone number so I can call you and explain? As mentioned l don’t have an address at all. I was hoping you can assist me with this pls. Do you have a contact number so l can call you and discuss this over the phone.